Tamarind is the famous sweet-and-sour fruit of ancient times. 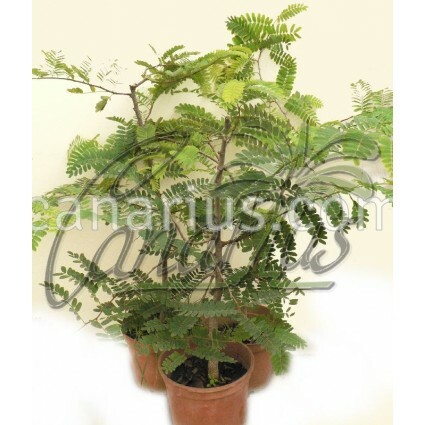 It is a semi-evergreen tropical tree native to East Africa but now spread in tropical Asia and South America. Pulp, leaves and bark have medicinal properties. Tamarind is the famous sweet-and-sour fruit of ancient times. It is a semi-evergreen tropical tree native to East Africa but now spread in tropical Asia and South America. The name tamarind comes from the Arab "tamar hindi" that means Indian date. The tree could reach up to 15 m (50 ft). Leaves have 10 to 18 folioles. Fruit is a long, brown bean containing up to twelve seeds and sticky brown tart-sweet pulp. The pulp is used as flavouring in Asian and South American cooking in grilling glazes, curries, preserves and chutney; it is also an essential ingredient of sauces. Pulp, leaves and bark have medicinal properties, for example leaves are traditionally used as tea in Filipinas to reduce fevers of malaria. The density and durability of wood makes it useful for furniture. It is very easy to grow, it survives extreme drought and needs warm summer weather to grow. Tamarindus indica is sensitive to frost, but it can endure cool frost free winters without problems. The size of this plant is 30-60 cm tall, branched, about two years old, in a deep tall pot. Notice: This species sheds leaves in winter, so don't be scared if the tree is leafless in the colder months.